SHIFTboston is calling on architects, installation artists, designers and landscape architects professionals and students to submit a concept for an experience installation, to be installed on a barge in Boston’s Fort Point Channel. Competitors are asked to develop a concept which might include one or all of the following components: recycled/recyclable materials, water, plants and perhaps digitally fabricated parts. 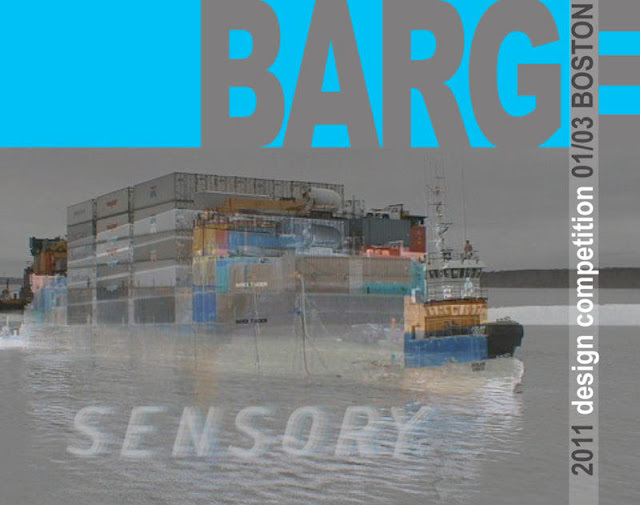 We would like designers to create a unique SENSORY EXPERIENCE for barge visitors by experimenting with a variety of interesting materials and applications in order to provide a TACTILE, OLFACTORY and VISUAL experience. We expect elements such as: water (spray, steam, shallow pools,piping), swings, comfortable lounging spaces, lighting, sound. We would like competitors to explore a closed-loop system. We prefer design elements which will NOT require grid-based energy. Competitors should seek alternative energy sources, design systems which take advantage of the basic laws of physics and environmental fluid mechanics. - The honorary recipient will present his/her concept at the SHIFTboston BARGE Forum at Institute of Contemporary Art/Boston on Wednesday, March 23, 2011. - The honorary recipient will be given $10,000 to fabricate and install his/her design on the barge. The finished barge will be open to visitors during the months of September and October of 2011 and there will be an opening event on Friday, September 16th, 2011. - All finalists and eligible entries will be promoted on the SHIFTboston blog and website and will become part of the SHIFTboston BARGE book. Stefan Behnisch Principal and Founder of Behnisch Architekten Stuttgart, Germany, Venice, CA and Boston, MA. Craig Scott Principal of Iwamoto Scott Architects San Francisco, CA.